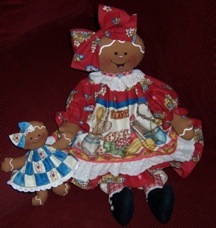 Primitive Gingerbread Annie Doll – So Sweet! There is a doll maker who makes the cutest hand made Gingerbread dolls that you can get for any season and holiday as they are dressed for “every day” or “Christmas”, “Easter”, “St. Patrick’s Day” and more. Visit here to see all the adorable Gingerbread dolls.